Mr. Darcy became famous in the social media due to a situation that occurred in Las Vegas recently, and even if what happens in Vegas, stays in Vegas I decided to take my chance and invite him to speak about it and clarify the rumours that have been going on. He is a very reserved person so I was surprised that he agreed to visit From Pemberley to Milton, but he did, so today you will find out a little more about “the Vegas issue”. First of all, thank you for taking a few minutes out of your busy schedule to stop by today Mr. Darcy. William Darcy – You are very welcome. FPTM – So Mr. Darcy, let’s get right to the reason you’re visiting us today. In view of your recent experience, you’re here today to share what can be done if we find ourselves receiving negative attention through social media. First of all, can you explain how you found yourself in this situation? W. Darcy – I was attending a large conference in Las Vegas, at which I was one of the guest speakers. I was surrounded by both my peers and others in various aspects of our line of work. On the last day of the conference, I was, for lack of a better way of putting it, slipped a mickey, as was the woman in the photos that later went viral. Evidence we have uncovered strongly suggest it was done with malice, with the intention of harming my reputation. FPTM -I understand that your team was able to track down the person or persons, who were responsible for drugging you and then posting the pictures we’re referring to. Why weren’t any charges filed against them? You are after all a lawyer. W. Darcy – First, I’d like to make it clear than the two events, drugging myself and the woman involved, and the posting of the pictures later taken, are two separate events. We do not believe that the young woman who took what she saw as humorous photos was in any way working with the unscrupulous individual who was solely responsible for slipping a drug into our drinks. The person who took and posted the photos has expressed regret for her role in the embarrassment caused by her actions. She has removed her posts. The other individual was very clever in disguising his crime. It would have been difficult to prove his involvement. However, as with most criminals, he later made a mistake involving another matter and is incarcerated at this very moment, awaiting a hearing. So in the end we believe justice will be served. FPTM – I’m glad the matter was resolved. But, still, you had to take measures to defend yourself from the backlash of other people’s actions. What did you learn that may be of benefit to others who find themselves in a similar situation, Mr. Darcy? One, it was an unfortunate incident. But I want to stress that it was just an incident. While it can be a challenge to recover from, it’s by no means impossible. First and foremost you need to plaster your web presence with our own pictures and information about all the positive aspects of your life. Second, try to find out who posted and ask them to take it down. It’s already been downloaded by a large number of other people but it’s still important to stop it from spreading at the source. In my case, as is true in the majority of cases, the motive was to get a laugh, likes and shares on social media. To strong-arm them, use intimidation is usually not the best way to react. You’ll get better results by appealing to their good nature and a small token of appreciation afterwards is usually well-received. FPTM – Practical advice, Mr. Darcy. But while we have you here, we’d like to find out a little more about one of the best legal minds in the country. The law firm Darcy and Associates was actually started by your Father, the late Mr. George Darcy. Is that why you decided to become a lawyer, to follow in your father’s footsteps? W. Darcy – While I certainly have followed in his footsteps in respect to my choice of profession, I wouldn’t say that was my motivation. My father had a successful practice long before I was born and as a result, I was exposed to the world of the law. I can remember being quite young and seeing my father being interviewed on television about a very high-profile case. I was intrigued, not by the fact that my father was on tv, but rather by the details of the case. I had endless questions for him from that moment on. I enjoyed few things more than discussing nuances of the law with my father and any of his associates that came to our home, Pemberley. FPTM – Interesting. One might say you basically cut your teeth on the law. That explains why so many consider you to be the go to man when they need the best of the best defense lawyer. So, what do you consider to have been your greatest achievement? W. Darcy – Well, without a doubt that would be in successfully raising my sister. She was just eight years old at the time of our father’s death and I only eighteen. Georgiana’s turning out to be a happy and well-adjusted adult has been my single greatest achievement. FPTM – And your greatest regret? W. Darcy – Certainly I have regrets that are a result of my own making, but I regret more than anything that I had so short a time with my dear mother and that my sister had none. Mom was an extraordinary person. FPTM – I’m very sorry for your loss. She would have been very proud of both her children. I understand your father was, by all accounts, a big sports fan. Do you share that same passion? W. Darcy – I’m afraid not. Growing up, my cousin, Richard, was always perplexed by how someone of my height could be so inept at basketball. My father loved to watch sports, especially football. I could never really understand the attraction. However, I have always had horses and riding has been and remains a great joy of my life. FPTM – You have some beautiful animals. Perhaps if you lived in Europe, instead of America, your sport would have been polo. W. Darcy – Yes, now that is a sport I could get behind. FPTM – So, if you don’t enjoy sitting down to watch sports, do you enjoy watching? TV or movies? W. Darcy – I’m not a big tv watcher except for Fox News. But I do enjoy movies. I have fond memories of going to the movies and theater with my parents, a tradition I kept up with my sister. FPTM – And what is your favorite movie? W. Darcy – My all time favorite movie is Hombre, with Paul Newman. The Sting and Butch Cassidy and the Sundance Kid are at the top of my list as well. FPTM – Ah, so you’re an old movie buff then? W. Darcy – You could say that, yes. However, sometimes I go for a good action hero movie. I like the no nonsense approach of Tony Stark. W. Darcy – hum…well, I don’t have much free time left, so if they are really fast questions, I can still answer before leaving. FPTM – Thank you Mr Darcy. I promise not to take much more of your time. I know you love reading, what is your favourite book? W. Darcy – Anything Isaac Asimov, Pebble in the sky, the Foundation series. I’ve read them all many times. W. Darcy – Classical piano. W. Darcy – New York will always feel like home to me, but Paris holds a special place in my heart now as well. W. Darcy – Blondes for sisters, and a brunette for everything else. FPTM – Good answer! Left me thinking on the everything else though…Coffee or tea? W. Darcy – Well, I had many long nights as a law student, you know. So black coffee it is. FPTM – Well, thank you for stopping by and answering a few questions, Mr. Darcy. I understand you have a lunch appointment with your Aunt, Catherine de Bourgh, which you cannot be late for? W. Darcy -You’ve had the pleasure of interviewing my aunt on several occasions, so you understand, she is not one to be kept waiting. FPTM – Yes, she’s always a delightful guest. Please send my regards. On their last night there, after the conference was officially over, it seemed like practically everyone in attendance was ready to have some fun, and take advantage of what Vegas had to offer. Elizabeth wasn’t interested in their kind of partying and slipped out on her own. She made her way to the in house restaurant and took a seat at the bar. “For a limited time we have an Italian eggnog martini to die for, complete with peppermint stick garnish,” the bartender suggested. George watched her until she turned the corner and was out of sight. “Coming right up,” the bartender said as he turned to gather the ingredients. Scanning the area to make sure no one was looking, Wickham took the opportunity to slip a little something into Lizzy’s drink. Well Lizzy, I don’t think you’re going to make that show tonight, he thought smugly. As the bartender set his drink in front of him, Will took a seat a few chairs down. Not noticing anyone other patrons at first, he ordered a seven and crown before looking around, and spotting Wickham. George raised his glass in greeting. Before Will had time to react, a group of attendees entered the bar area. “Well, if it isn’t Will Darcy!” one of the men in the group said loudly. “I’d love to,” Will answered, ready to get as far away from Wickham as possible. “Sir! Sir!” the bartender called after Will, who was following the noisy group into the main dining room. “He forgot his drink,” he offhandedly commented to George. “I really can’t, I have other plans,” Elizabeth begged off. “Then I do too,” George answered giving Elizabeth a look she understood completely. The group lingered, some noticing Elizabeth for the first time, stopping to chat and inviting her to join them. Remembering Darcy’s drink, a delightful thought occurred to George. He made his way over to where Will had left it and with all the commotion going on and the bartender at the other end waiting on other customers who had come in, George slipped the rest of what he had on him into the drink. Looking around, he spotted a hostess and made his way towards her. “Of course,” she answered and hurried off to fulfill the request. George stepped back and watch as Darcy took the drink from the young woman, thanked her and took a sip. Ha! Now let’s see what your admirers think of you when you start to slur your words and get drunk on one drink, Mr. High and Mighty! George went back to the group and left arm in arm with one of his coworkers, grinning from ear to ear and congratulating himself for his cleverness. After finishing his drink, Will placed his order for a glass of wine to be served with his food before excusing himself from the table, and headed to the restrooms. He glanced at the bar to see if Wickham was still there, but to his shock, he saw Miss Bennet instead. He hesitated for an instant but decided he wanted to speak to her more than he wanted to avoid her. She looked his way as he approached. “Oh, you know…” was the only answer she managed. “I’m feeling rather flushed. I think I need to cool off in the fountain,” Will said as he stood with difficulty. “Now that’s an idea I can get behind,” Elizabeth said before she burst out laughing. Will began to laugh with her, first softly then so hard he had trouble catching his breath. 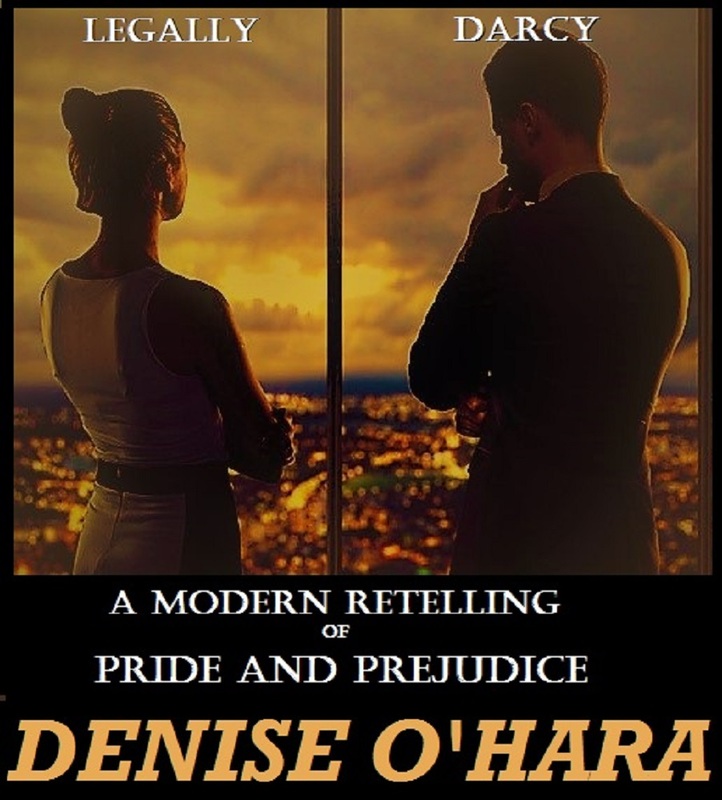 Denise O’Hara would like to offer 2 ebook copies of Legally Darcy to my readers. All you have to do is comment on this post and share your thoughts with us. The giveaway is international and is open until the 26th of January. The winners will be announced shortly after. Make sure you visit From Pemberley to Milton to see if you were one of the lucky winners or follow the blog to receive directly in your e-mail the posts announcing the winners. So much potential in that scenario! This book was already on my wishlist, but I’d be thrilled to win a copy. I look forward to seeing what antics they get up to. Enjoyed the interview, too! Always fun to get to know a new to me Darcy. Fun interview! This one sounds great. Me too, I love to explore new Darcy’s 🙂 Good luck in the giveaway Sophia. Such a lovely excerpt, I’d love to read more. I loved Timeless, and I’m looking forward to reading this new story. What a fun interview! and I loved the excerpt too. It sounds like a great book! Thanks for the giveaway! Thanks Daniela, good luck in the giveaway! Love this interview Rita. Poor man surely has a talent for insulting Elizabeth. Wickham would have been surprised to see how his revenge worked out! Please don’t enter me in the giveaway as I was lucky enough to win this book already and have just finished it. Thanks for the lovely post. Thanks Glynis!I’ll check GR to see if you have a review there 🙂 I would love to know your opinion. Now that was fun and one I haven’t read yet. Thanks for the interview and excerpt. Best Wishes with your new book. Loved the interview! The excerpt certainly sounds rather intriguing! Will have to add this one to my wishlist! Thank you for the giveaway! Wickham just can’t help himself, can he? He has to be in control of something, no matter what the consequences may be. The worse those consequences are for someone else, never himself of course, the better he’ll like it. Can’t wait to see how he gets his comeuppance! That was a terrific interview, Rita. I’m so happy to see that Mr. Darcy is a fan of Isaac Asimov. Pebble in the Sky is one of my favourite Asimov books – planet Earth has become a backwater planet after humans have spread out into space. Yes, I AM a sci-fi geek as well as a Janeite. This book sounds great & so does the Italian eggnog martini !! Oh! What a way to end an excerpt! Just enough to entice you to find out what happens next! I hope Wickham’s actions will backfire and have a positive effect on Darcy and Lizzy! Can’t wait to find out what happens next,Rita! Loved the interview with Darcy! He thinks he’s so in control of everything!!! Poor guy! I’ve downloaded this book so please exclude me from the draw. Catching up on unopened e-mails: I did read and review the book and enjoyed the interview here. Thanks for sharing. Even though it was a while back I can still remember the pleasure…and my connection as my husband is an attorney. Fox News…interesting. I get pop-ups on my cell phone from that media.